With Injustice: Gods Among Us now on store shelves, NetherRealm Studios is planning to roll out new downloadable fighters for the title. First on deck? A grumpy bounty hunter straight outta the 1990s. Hopefully those of you with any interest in fighting games or comic books have already picked up Injustice: Gods Among Us. Not only is the game a great comic book adaptation, but it's also one of the top fighters of this generation - and may well be the best virtual fisticuffs simulator to ever come from the developers of Mortal Kombat. With that established, it's time to look toward the game's future, specifically toward what the future holds for the game's roster. Game Informer recently published an interview with NetherRealm Studios creative director Ed Boon, in which the Mortal Kombat co-creator reveals what comes next for the game. Most crucially, Boon names the first DLC fighter for Injustice, a lovable superpowered space biker known simply as "Lobo." 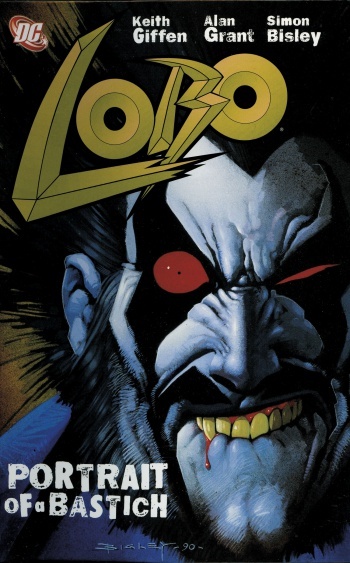 Those of you who aren't up on your DC Comics lore may know Lobo from sporadic appearances in various DC Animated television programs. If not, the key thing you need know about the character is that he's super-strong, nigh-invulnerable, and features all of the aesthetic and characterization hallmarks of a comic book character created during an era in which Rob Liefeld was considered a brilliant artist. Continuing, Boon discusses NetherRealm's plans for expanding Injustice beyond the four DLC fighters the firm has publicly revealed are in store for the title. Unfortunately, there isn't much to tell. "There are currently no plans to add new stages for DLC," Boon states. "We are going to have at least four characters." "Beyond the four, there isn't anything we can announce. I certainly don't think I can safely say that it's four and only four. The DLC characters for Mortal Kombat exceeded everybody's expectations. I suppose there is a certain point in time where we can say that there won't be more. I don't think we'll be releasing DLC characters two years from now. At some point, we've got to jump on our next game." Speaking of Mortal Kombat, fans of that game will remember the confusion players felt when NetherRealm revealed Nightmare on Elm Street antagonist Freddy Krueger as a DLC character for that title. While Boon wouldn't say whether or not Injustice will feature a similarly baffling roster addition, he does point out that fans seemed to love the swerve. "[Freddie spawned] a conversation amongst us about whether we should do a guest character [for Injustice]," Boon says. "Some people thought it was great. Some people were nervous about it. He ended up being the biggest selling one of all." Given that, though Boon is obviously trying to play coy, it doesn't seem as if NetherRealm has given up on the possibility of adding a guest fighter to Injustice. With that in mind, who would you like to see appear in Injustice: Gods Among Us beyond the standard DC Comics characters? Keep in mind that the game is published by Warner Bros. Interactive, a wing of one of the largest media companies on the planet, which has generated a huge number of popular films and television series' over the past century. A very condensed list might include The Matrix, Animaniacs, and even Space Jam. That leaves a massive number of properties from which NetherRealm could potentially draw new fighters, so please, fill the comments below with your predictions, guesses and breathless hopes as to who might join the Injustice: Gods Among Us character select screen in the near future.